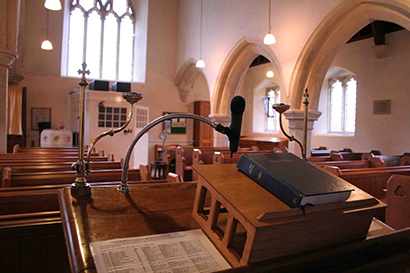 Today's Gospel passage is extremely long, recapturing the Passion narrative that was read from a great group of Lay Readers at All Saints' this past Sunday. 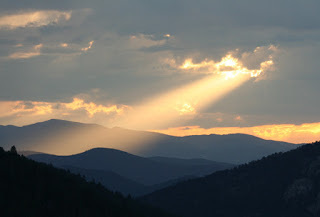 I'm sharing a portion of that large passage to accompany our thoughts in this moment. While I'd seriously doubt that many reading this today have actually witnessed a Crucifixion, yet most have seen one or more theatrical or cinematic dramatization of the event. Many of these dramatic recreations are relatively sterilized while some are extremely graphic and visceral. But the bloodiest depiction fails to capture the horrors of a roman crucifixion, an execution engineered to inflict one of the worst deaths a human may endure. The Gospels capture a sense of this in their description of how the Roman execution detail broke the legs of two of the sufferer's in order to accelerate their end. It was approaching 3:00 PM in Jerusalem. It could easily have been 68 Degrees Fahrenheit or 20C and fair on any given day, but this was an afternoon like no other. Three hours prior, an unnatural darkness enveloped Jerusalem that held the city in the grip of twilight. in this gloom, each breath taken by the master took the full measure of his strength as he strained against the nails to fill his lungs. No doubt, he was dehydrated and in shock from being beaten and awake for 33 hours. 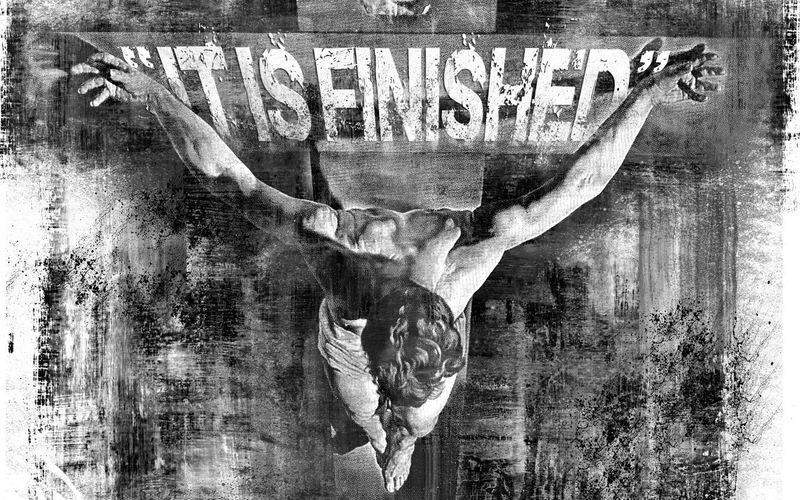 For all of this, the Christ WOULD NOT die until his mission was complete. In these moments, Jesus scans the perimeter, and sees his Disciple John Bar Zebedee with Mary, his Mother. He commends his mother into John's care while comforting his mother that John would care for her. Now, his thirst slaked by the sour wine, Jesus was able to cry out in a loud voice that the redemption of the Creation was complete. 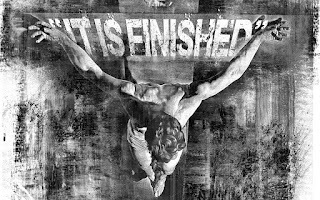 His words captured the sense that our sin debt at that moment was now paid in full. When I first became aware of the word "Collect", it had a strange ring to it. But simply put, a "Collect" is simply a prayer meant to gather the intentions of of the people and the focus of the worship into a succinct prayer. Anglican Collects seem to follow a certain meter and have been a part of historic Anglican since the time of Archbishop Cramner. Today's apropos prayer calls to mind the Sacrament that was first instituted over two milennia this evening. 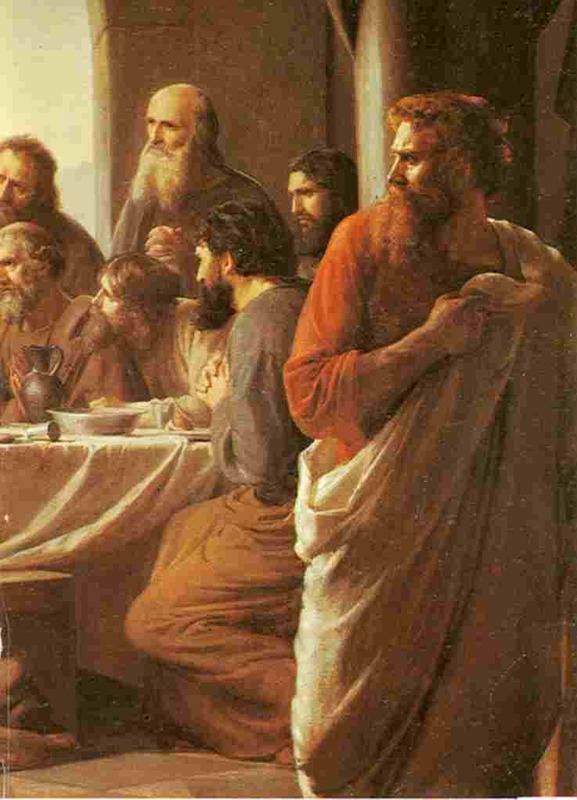 Perhaps its our aversion to the baring our feet in in church to be washed by a nodding acquaintance that drives many to place the focus of Maundy Thursday on the institution of the Eucharist rather than the call to the humility of washing a possible stranger's feet. I inwardly cringe at the thought of someone being confronted by my gnarly, middle-aged dogs. But its at this moment that I'm reminded that it was the composer and conductor of the Aria of Creation who stripped down to his underwear to wash the dirty fallen feet of his Apostles, feet he conceived in Eternity past. I continue to be arrested by this moment. The Christ is mere hours away from enduring the most hellish ordeal ever endured by one clothed in human flesh. The spotless Passover lamb would soon have the sins of the vilest offenders laid upon his shoulders. It's weight may have felt like the shattering blow from a pile driver. It's at moments of reflection, such as now, my careless sins and betrayals become a foul, wretched stench in my own nostrils. In this unfolding moment. 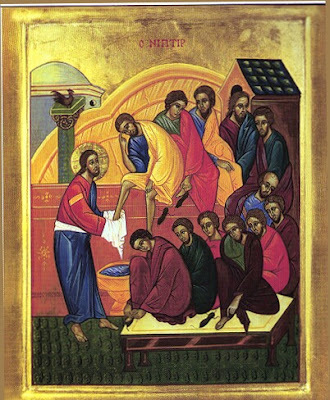 Christ, in demonstrating this love that loves someone to the end, strips down to his inner garments and girds himself with a towel in preparation to wash the feet of his disciples. Try to imagine a dinner where the host suddenly strips down to his boxers and tee-shirt; it would be an awkward moment at the very least. The Christ of God is now seen as the servant of all; transformed from High King of Heaven to lowly house slave. All were shocked, but Peter seems to have been scandalized as seen in his reaction. Jesus doesn't mince words; without this "washing" St. Peter would have no share in the Kingdom. Peter suddenly gets it, and all but asks for a bath. For a visual learner, this moment in the Gospel packs a powerful punch. It teaches volumes about the Kingdom and how it will unfold. It shows us that the Kingdom looks far more like a tiny sun-baked Albanian nun cradling the dying than a slick, polished preacher trying to sell you your best life now. Its self-emptying rather than self-aggrandizing. Our Lord has no need or use for strutting popinjays who seem to pervade the vast spiritual and cultural wasteland. The "No Fear" Crowd does little more than stir His holy wrath. He saw all of these traits in His onetime anointed cherub, and threw both him and his company of fallen angels down from Heaven. No, He seeks something quite to the contrary. Consider on this Maundy Thursday... Our Lord seeks those who've grasped the concept that in the greater scheme of things, they're truly of no account. They've got nothing to bring to the table. These are the ones whom the Master can fill with His power, and may well use them mightily in proclaiming the good news of the kingdom in both word and action. From the moment of the fall, when the works of the flesh supplanted the fruits of the Spirit, treachery became a stain on humanity. Treachery, in its most basic, is defined as a violation of allegiance, or of faith and confidence by Webster. It is carried out in shadows. It occurs through the furtive actions of cowards unable to face the recipients of their actions. In Dante's Inferno, the deepest depths of Hell were reserved for history's worst traitors. But at this moment, this man remembered in infamy is seated at the same table with the Christ of God. A deep scene is unfolding as Saint John, the beloved disciple of God, hears his Master uncover the conspiracy. Ten of the Apostles are instantly thrown into a tangle of anxiety while the eleventh was now doubtlessly experiencing a surge of fear and adrenaline as his plan is unmasked and exposed to all. Even the youngest of the band was now in a moment of self-examination. Jesus would answer all of their questions in a moment. The sop, a piece of the hard unleavened bread made soft by wine perhaps, was handed to the man from Kerioth. In the unseen realm of this moment, the sop hit Judas' hand with all of the force of a firing pin striking a primer cap. The Holy Spirit which had once rested upon this man was gone, and Lucifer himself entered him. At once, any fellowship he may have enjoyed with The Christ was irrevocably severed. He was now compelled by the command of God to depart and set his plan into motion. Many have offered up theories as to why. Judas did as he did. I've no intention of doing that in this space.Yet it is important to remember that there would be two betrayals over the next several hours. Each would have completely different outcomes. Lent, and Holy Week, compel us to look deep into the mirror. It demands that we too ask, "Is it me Lord?" "When he drew near to Bethphage and Bethany, at the mount that is called Olivet, he sent two of the disciples,saying, "Go into the village in front of you, where on entering you will find a colt tied, on which no one has ever yet sat. Untie it and bring it here. If anyone asks you, 'Why are you untying it?' you shall say this: 'The Lord has need of it.'" So those who were sent went away and found it just as he had told them. And as they were untying the colt, its owners said to them, "Why are you untying the colt?" And they said, "The Lord has need of it." And they brought it to Jesus, and throwing their cloaks on the colt, they set Jesus on it. And as he rode along, they spread their cloaks on the road. As he was drawing near--already on the way down the Mount of Olives--the whole multitude of his disciples began to rejoice and praise God with a loud voice for all the mighty works that they had seen, saying, "Blessed is the King who comes in the name of the Lord! Peace in heaven and glory in the highest!" And some of the Pharisees in the crowd said to him, "Teacher, rebuke your disciples." He answered, "I tell you, if these were silent, the very stones would cry out." It was a cool, damp Palm Sunday morning here in Suburbia Majora. Where in year's past, the family at All Saint's (ASC) would begin Palm Sunday outside to process into the sanctuary, the celebration began in our Atrium. Still, even with the mist outside, the ASC family was Able to apprehend the magnitude of what's been referred to as both the Triumphal Entry and Palm Sunday. Father Scott Bailey's well-crafted homily worked to capture the moment. "Rejoice greatly, O daughter of Zion! Shout aloud, O daughter of Jerusalem! Behold, your king is coming to you; righteous and having salvation is he, humble and mounted on a donkey, on a colt, the foal of a donkey." History recalls how rulers would mount Donkeys or Mules when engaged in peaceful diplomatic missions. And if ever their was a peace mission, it was occurring here in the pages of the Gospels. The Christ entered into the Eternal City, the site of God's Holy Temple. A place where daily sacrifices had been offered for a millennia as an atonement for sin and transgressions. A place where five more sin offerings would be made by the Aaronic order of Jewish Priests before the once and final offering would be made for all of mankind. 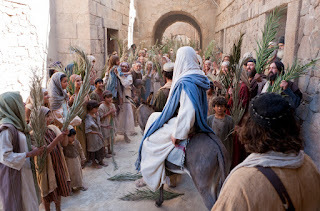 We can pause, and ask how many of these who were crying out "Hosanna" would bitterly shout "Crucify him" in a few short days. Six days before the Passover, Jesus therefore came to Bethany, where Lazarus was, whom Jesus had raised from the dead. So they gave a dinner for him there. Martha served, and Lazarus was one of those reclining with him at table. Mary therefore took a pound of expensive ointment made from pure nard, and anointed the feet of Jesus and wiped his feet with her hair. The house was filled with the fragrance of the perfume. But Judas Iscariot, one of his disciples (he who was about to betray him), said, "Why was this ointment not sold for three hundred denarii and given to the poor?" He said this, not because he cared about the poor, but because he was a thief, and having charge of the moneybag he used to help himself to what was put into it. Jesus said, "Leave her alone, so that she may keep it for the day of my burial. 8 For the poor you always have with you, but you do not always have me." Mary, the sister of Lazarus, was the one who for whatever reason, seemed to be far more spiritually attuned to the Christ as seen from the Gospel narratives. While her sister Martha was seen as busy preparing for Jesus, Mary was commended for listening and sitting at the feet of the Master. So, in this scene, we see a devoted, grateful Mary, in a moment of unbridled devotion to her Lord, in taking a very expensive perfume and anointing the feet of the master. The very feet the next day, that would set off for Jerusalem. I find a few moments in which to latch onto in these moments. The Humanity of Jesus. The "very God of very God" was also very human. And like us, he enjoyed the company of friends. I believe that we can reasonably conclude that this family group (Lazarus, Mary, and Martha) were personally known by the master. He clearly loved them, as witnessed by his reaction to the death of Lazarus. Now, before the consummation of his mission to Redeem fallen man, he comes to Bethany to rest an enjoy the fellowship of friends. The Devotion of Mary. The discussions during that visit are known only to time and eternity. Did the Master share with the siblings, what was to unfold in the coming hours? We don't know. What we do know, is that Mary took the most treasured object in the home and anointed her friend and Savior. Those who love, and know Jesus of Nazareth will someday share in that same closeness as did this family in Bethany. As for me, I long for that moment.